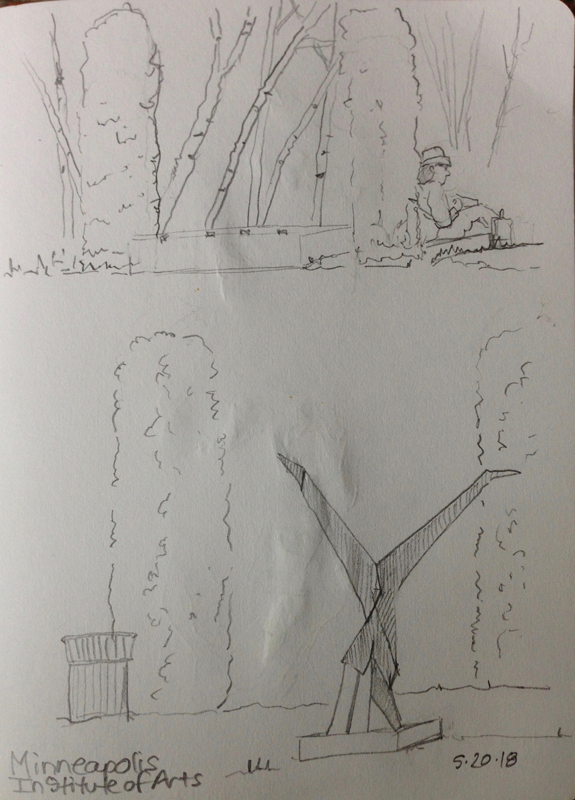 On Sunday I had the opportunity to sketch at the Minneapolis Institute of Art with the Urban sketchers. I took only pencil because the museum doesn’t allow any wet mediums indoors. I missed my paints. After spending time outside sketching some hedges, another sketcher, and a metal statue, I went inside to see the Power and Beauty in China’s Last Dynasty exhibit. Wow, stuff is OLD! I saw kimonos, intricate drawings of gardens, rivers, mountains, and people (one scroll was designed by a guy who finger painted with ink and also grew his fingernail long then cut prongs in it like a brush to apply ink). I sketched a replica of a tea house, and wandered around statues, vases, and more! I settled on the Vajra Warrior statue, from Japan, Muromachi Period. Mid-14th Century CE. The fun thing about statues is that they don’t move (unlike real people). So I studied the contours, values, and folds of fabric, and got to work. These warrior statues were used as guards for Buddhist temples, and they indeed looked quite fierce. I walked around the front of the statue after sketching it and its mouth was open with a snarl and you could imagine a fierce cry coming out of its lungs. That would have scared some people off!